Squarespace. Build it Beautiful. Celebrating 10 years of making it fast and easy to create an exceptional-looking website! Get 10% off your first purchase at squarespace.com/twist. With Citrix GoToMeeting, “Meeting is Believing.” Sign up for a free 30 day trial. Visit GoToMeeting.com and click the “TRY IT FREE” button. 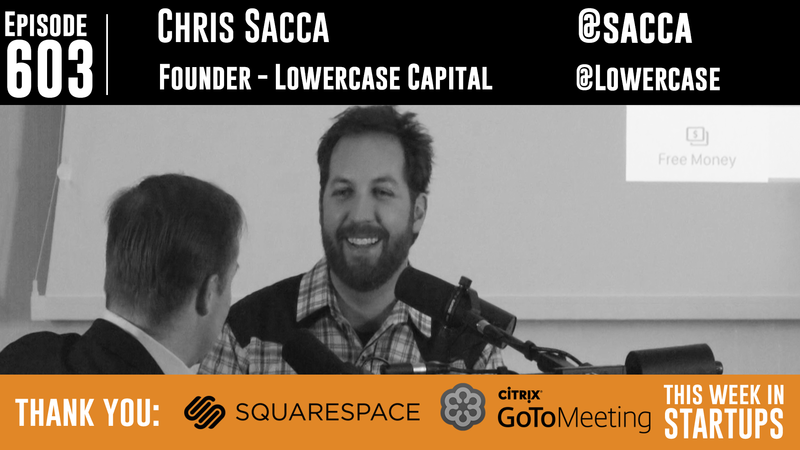 Legendary angel investor and “Shark Tank” star Chris Sacca returns to TWiST! Chris and Jason sit down to discuss everything from investing in relationships to Jack Dorsey as Twitter’s CEO (now and early on). He talks about what he looks for in an investment, how he met Matt Mazzeo, those early years with Twitter and selling people on the business, and how his dream job involved “a lot of being on the phone, a lot of yelling at people… high risk, high reward.” Chris shares his experiences on “Shark Tank,” how fun it is to bust the chops (he uses a different term…) of Mark Cuban and Kevin O’Leary, and how TV could be part of the next chapter of Chris’ life. Chris also listens to pitches from three companies that came out of Jason’s LAUNCH Incubator – Requested, LeadIQ and Benchmade Modern – offering feedback to each of the three founders about their businesses and how to move forward. Find us on Spotify Now. Special thanks to the members of the TWiST Backchannel!